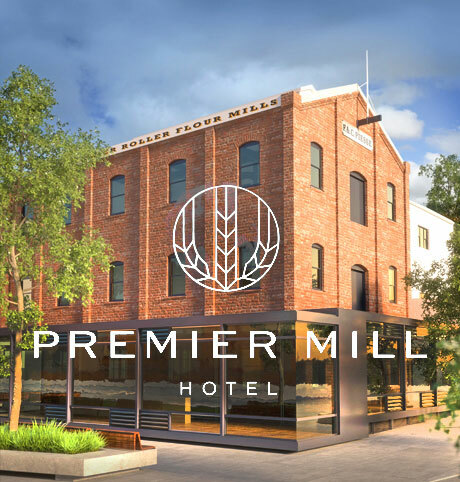 A cornerstone building in the centre of town, the Premier Roller Flour Mill has been at the core of Katanning’s heart and soul since its foundation in 1891. Incredibly its commercial success as a flour milling operation spanned only a couple of decades. Most remarkable is its story of relentless adaptation through the decades. Provision by the Mill of commercial electric power and lighting to the wider township spawned a new era of industry in Katanning. Frederick Piesse, the Mill’s founder, was at the centre of this new era of industrialisation with substantial interests in aerated waters and cordial manufacturing as well as expansive interests in viticulture and fruit processing. Not only manufacturing, the Mill was at the heart of a bustling local service economy. From 1930, the old verandah skirting the ground level of the Mill was redeveloped into a vibrant row of shops fronting both main streets. “Mill Corner” as it was fondly known to locals soon became home to the town’s favourite music emporium, butchery, dress shops, a barber and even a much loved tea room known as “The Wattle”. As the 1980’s approached, Old Mill Corner had fallen into decline. Flour manufacturing had long ceased as had a failed foray into the oats business. Significant manufacturing interests supported by the Mill had moved to the city and the State Electricity Commission had decades previously assumed control of the Mill’s power generation business. As larger supermarkets and general stores came to town, the retailing on Mill corner also took a turn for the worse. Facing dereliction the future of the iconic Katanning Premier Roller Flour Mill suddenly looked rather bleak.